Cool riff on the traditional Christmas Carol storyline! Recently, an unprecedented amount of CEOs, Wall Street bankers and similar folks known for their charity (*/sarcasm off*) has donated their fortunes to charitable organizations…particularly those clashing with their erstwhile enterprises. The PCs are contacted by Mr. Fezziwig, clearly an alias of the intermediary, who works for E.S. – the CEO of a major bank. E.S.’s CFO has suddenly resigned, selling all personal stock in the company. After being pressured by Fezziwig, the CFO has admitted to having been visited by 3 ghosts who showed him the error of his ways. E.S. and Fezziwig are certain that the man believes this – and has hired the PCs to debunk the story or stop the ghosts, should they really exist. Some in-depth investigation provides some puzzling insights: There are no Ghosts of Christmas Past, Present and Future – nor have there ever been. However, three heads of struggling charities has recently died – on Thanksgiving, of all days. These 3 spirits (division IV) now seek to do right, punishing scrupulous corporations….like the one that hired the PCs. And yes, if the PCs aren’t smart about it, the corporation *will* try to cheat them out of their well-deserved salary. Each of the 3 ghosts has a fitting signature ability…which are nice, though they could be a bit more precise regarding in-game effects, like relieving your worst moments. Ultimately, the module poses an interesting moral conundrum for young players and adults alike: Do the ghost hunters destroy the ghosts in favor of a pay-check, or do they ignore the money offered in favor of having the spirits dispense social justice? More intriguing for adult groups: What kind of impact would the series of CEOs retiring have? Will the well-meaning ghosts destroy more than do good? Surprisingly interesting conundrum! Editing and formatting are very good, I noticed no serious hiccups. Layout adheres to a pretty busy three-column full-color standard. The pdf has no bookmarks or artworks, but doesn’t need any at this length. 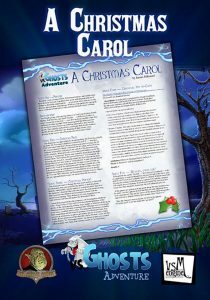 Lucus Palosaari’s riff on the classic Christmas Carol theme, Vs. Ghosts-style, is surprisingly good for a 1-page adventure: The contemporary riff on the theme has been done to death, yes, but the moral conundrum posed can render this more interesting than what you’d expect from such a small pdf. Equally fun for adults and kids, my final verdict will clock in at 4.5 stars, though I can’t round up for it. You can get this nice mini-adventure here on OBS!